I had fun preparing the images for this article. It got so long, I have broken it into parts. This is one of my variations of Can Can from Millefiori Quilts 3. I shared a few variations (pink/green and blue/green) on Facebook and Instagram recently. This article will help you whichever variation you choose. The original was designed by the amazing Willyne Hammerstein. There are only 5 fabrics in my version—simpler for quilters who find it difficult to choose dozens of fabrics for a quilt. It is 33% larger than the original. 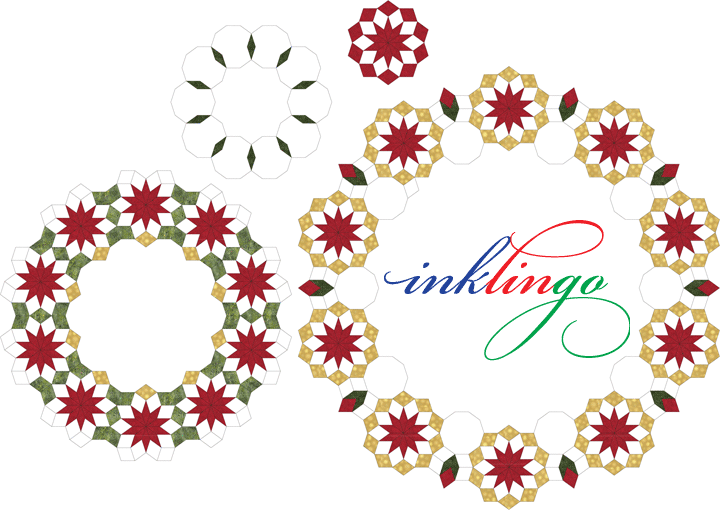 (4 cm diamonds instead of 3 cm) The yardage requirements in the book are not enough but as usual, the Inklingo shape collection illustrates yardage info with suggested page sizes. The larger shapes make a larger quilt (approx 63 x 74 inches without borders) and make it possible to sew at least some of it by machine. 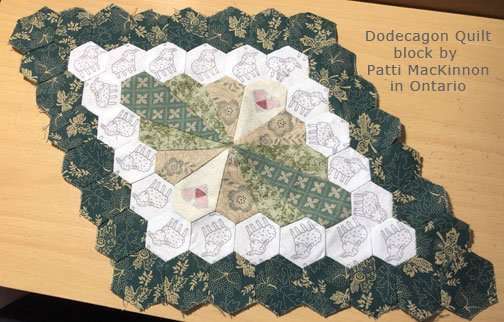 White decagons (10-sided shapes) replace pieced areas. 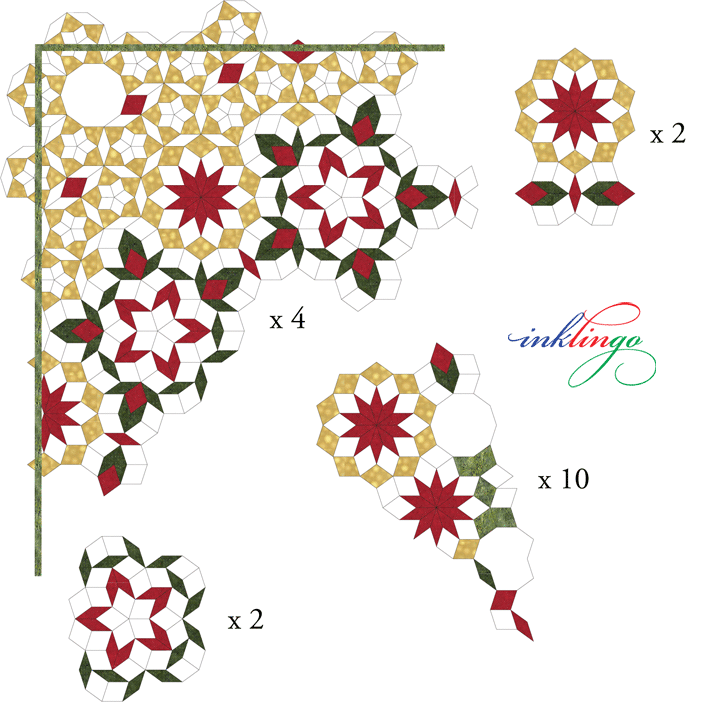 The decagons can be used to feature fussy cutting or elaborate quilting—or just to give a lighter, lacy effect. 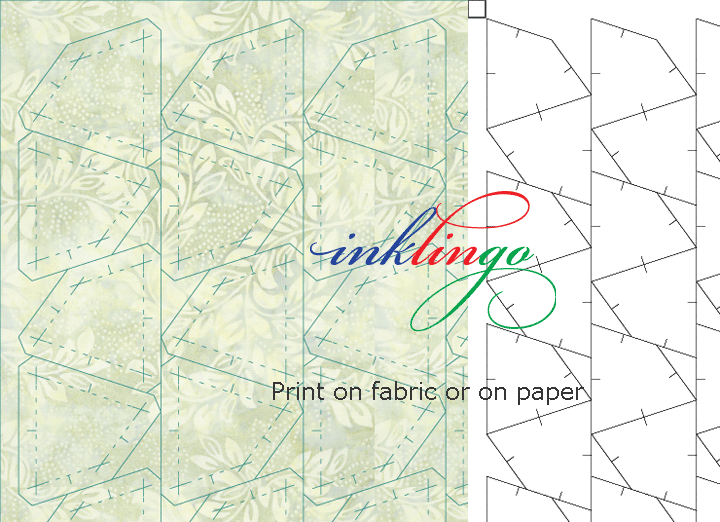 The Inklingo Can Can shape collection includes all of the shapes, with and without seam allowances, to print on fabric or on freezer paper. For the decagons, I print the Inklingo layouts without seam allowances on freezer paper for templates, instead of printing on fabric. 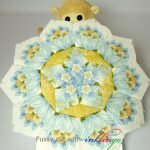 I have been teaching this method for almost two decades, beginning with my Quilted Diamonds books. I’ll give you the “bad” news first. No Cheat Sheet today. Giving you my Cheat Sheet would have been simpler but I want to show you how to do it yourself. Give a woman a fish . 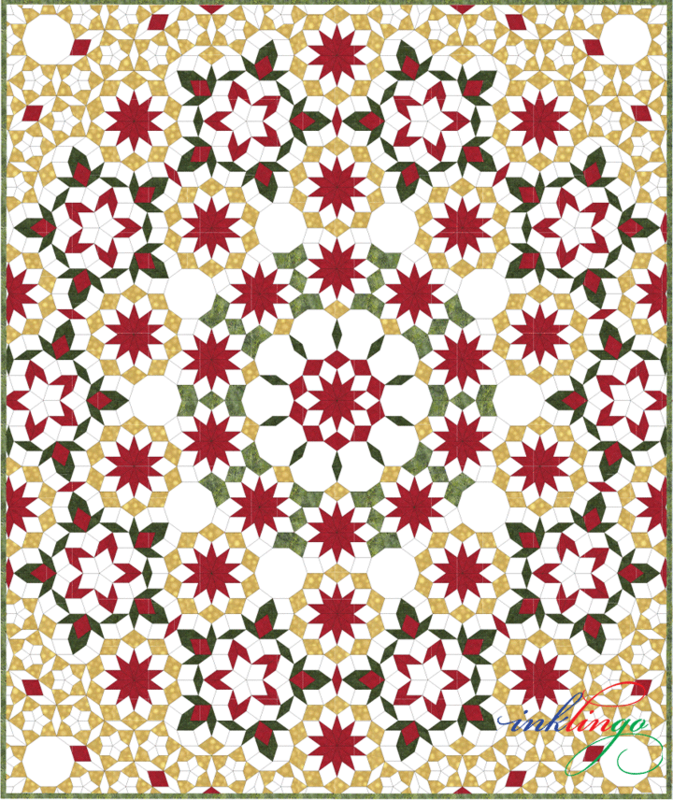 . . Give a quilter the yardage requirements for one variation and she might make that quilt. 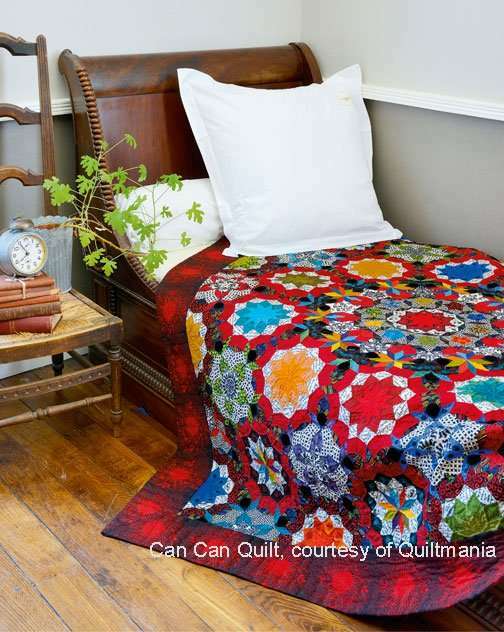 Teach a quilter how to do it and set her free for a lifetime of creativity. 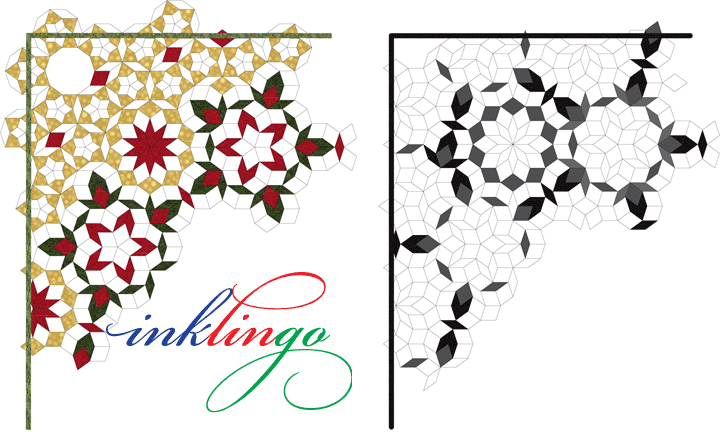 I think of myself as a teacher, and it is better for you if I show you how you can adapt ANY design to sew with Inklingo. Maybe you want 6 fabrics or more/fewer decagons, or a smaller quilt, or something asymmetrical. There are no limits. It’s your design. 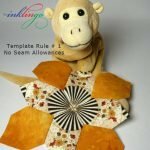 For many quilters, this process of choosing fabrics and preparing a Cheat Sheet with yardage requirements is fun—a visual puzzle like Sudoku—a challenge, and part of the satisfaction of making something original and unique to you. It all depends on your attitude. Other quilters skip the details and just commit to buying extra fabric, so they can be sure to have enough and can change direction on the fly. Inklingo gives you more options. The first thing I need to do is count the number of shapes A, B, C and D to be cut from each fabric. I divided the first image (top) into these sections. Looking at one section at a time makes it easier to count. For example, you don’t have to count all 4 corners: Count one and multiply by four. With this set of sections, I can count the shapes in each and multiply. There are many other ways to subdivide this design. You might want to work with this section, the center rosette, first . . .
. . . and then divide into rings, if that makes it easier for you to count. Whichever way you divide up the worksheet, the point is to make it easier to get an accurate count of shapes. You can double-check your work by subdividing a second time in a different way. I divided the rosette into ten slices for my second look (above). NOTE Sub-dividing the quilt to count the shapes does not need to have anything to do with the sewing sequence. 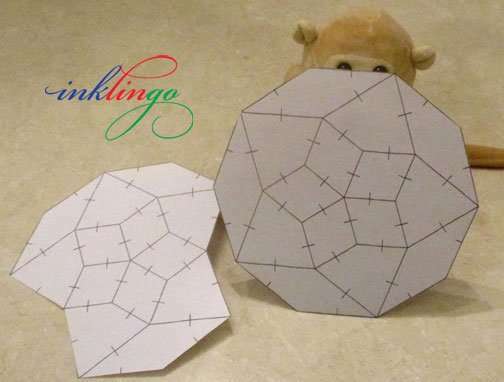 At this stage, we just want an accurate count of the shapes. 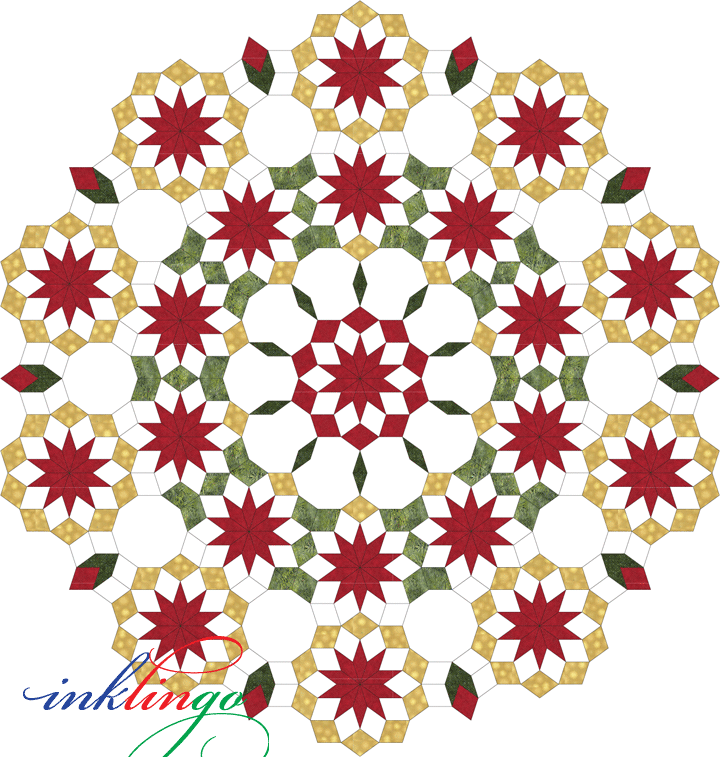 In this case, count the shapes in one slice of the rosette and multiply by 10. Then compare with the count from the first time. If they don’t match, have another look. With a very complex design like this, if you can, wait a day in between, so you get a fresh look the second time around. 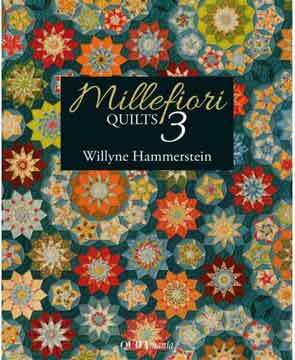 I’m saving more for Part 2 but I have described this process recently using Golden Wedding Ring as an example..
No matter which variation you make, there are detailed diagrams in Millefiori Quilts 3 for assembling the top. It is a gorgeous book brimming with amazing designs—and there are still a few on the shelf. Willyne teaches hand piecing with a running stitch. 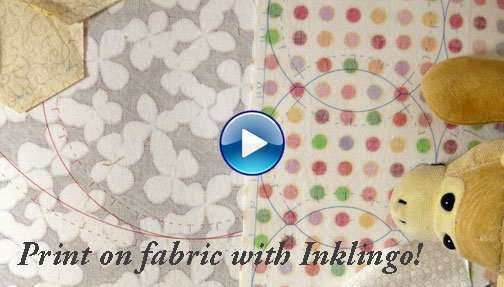 Printing the shapes on fabric makes the preparation fast AND precise, so these designs are accessible to more quilters. 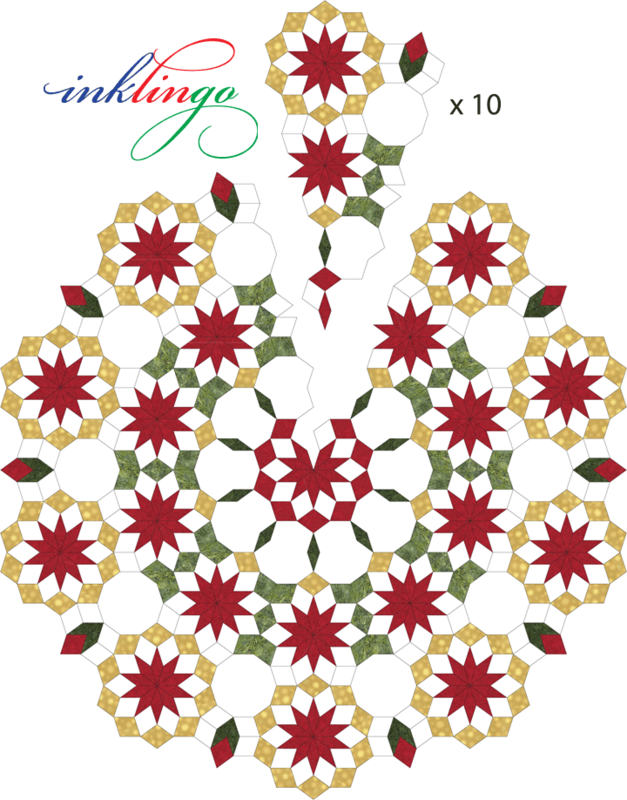 There are more images of Can Can in previous articles, and a list of other Inklingo-able Millefiori Quilts 3 designs on the website. I’ve lopped off many more images, so that’s all for today. I hope you will stay subscribed for Part 2. 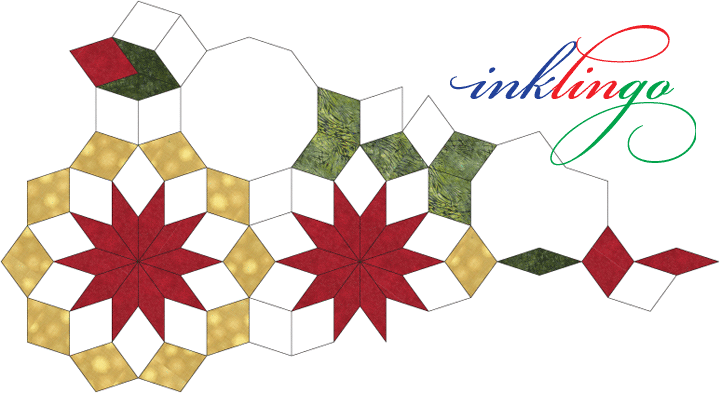 I sure hope you are going to share the uncolored quilt diagram with us so we can plan our own colorations. I have been dying to get my hands on one of those! Or maybe it is already in the shape collection? I love how you’re using Can Can to teach us who think we Can’t Can’t! I can’t wait for Part 2! I’m still learning at 71n1/2.lol. Thankyou Linda. Love what you are doing. That is what keeps you young, Jeannette. You won’t get old until you stop learning. So they say. Linda, I was just looking at the center part of the quilt. Did you see that it could be a beautiful x-mas wreath? 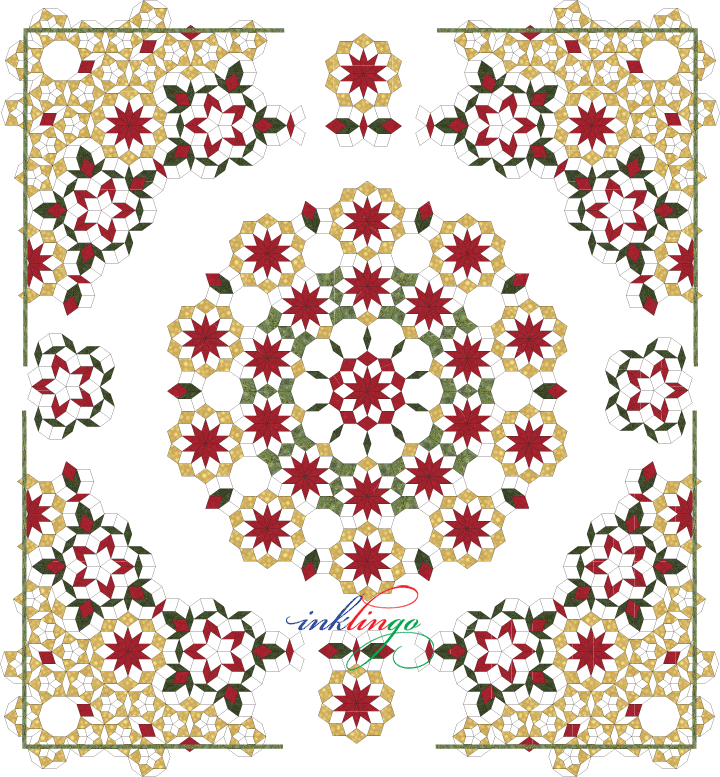 It’s perfect for such a project, just need the part with the 9 red stars and the center one of course and voilà. Beautiful ornement that can be made in no time att all. I was hoping someone would notice that. I really enjoyed working on this design. Well that’s what I call work all done for us! This is amazing, it’s no wonder it took so much time to make this for us. One question : Do you ever sleep? lol. I hope because you must be exhausted after all this. Thank you, Birgitt! I’m glad you like it!